Well, it's about that time. It makes me sad just thinking about it. Connor man is old enough to eat solids. If you remember, his first experience wasn't that great. He just wasn't all the interested. But it's a different story now (probably because I'm not just serving him cardboard tasting cereal!)... he LOVES it, and so far has eaten avacado, apple sauce and whole grain rice cereal. I thought I'd show yall how I make my own baby food (well, with the exception of the cereal and applesauce). 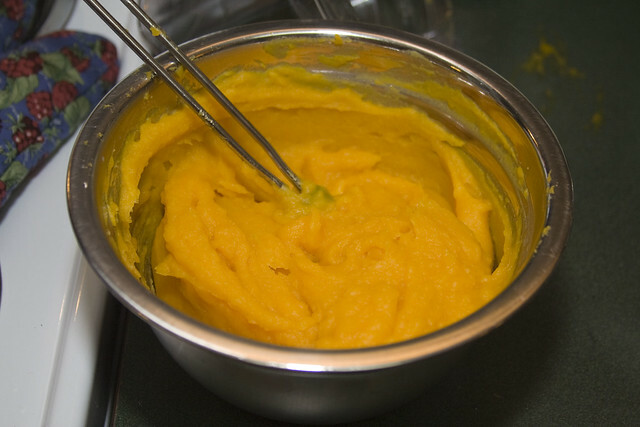 I started my first batch last night with butternut squash, which is one of the easier things to make in my personal opinion. SO, without further ado, I give you MUSHED UP SQUASH ALA BABY. 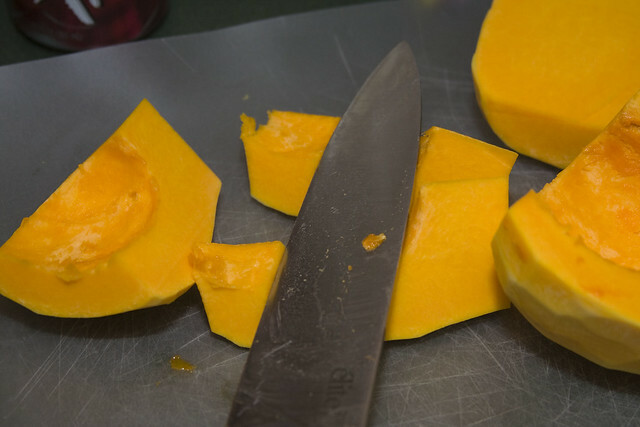 There are several ways to cook butternut squash. I find the fastest, easiest and least messy is making it in the microwave. 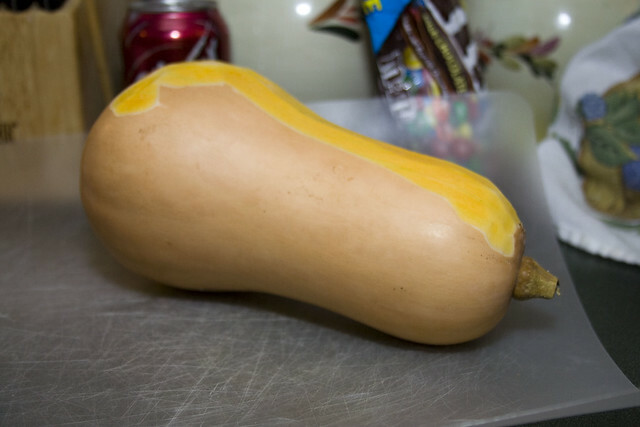 So you'll need to peel the squash completely, and cut off the ends. Doesn't this make you think of Veggie Tales? 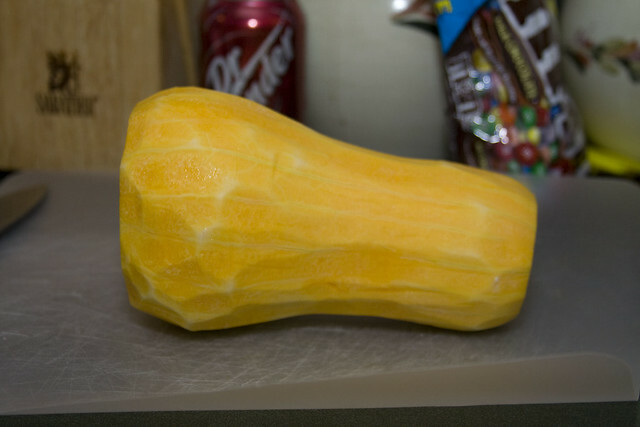 I kept reciting Veggie Tales songs while peeling the squash. Then microwave on full power for about 10 minutes. I did 5 minutes, then stirred, then another 5 minutes. You'll know it's done when you can easily puncture the pieces with a fork or knife. I forgot to take a picture of the finished cubed product. 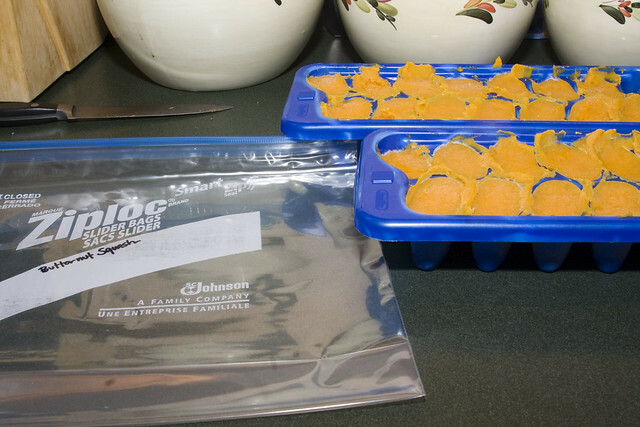 Next fill an ice cub container with the squash and make them level. 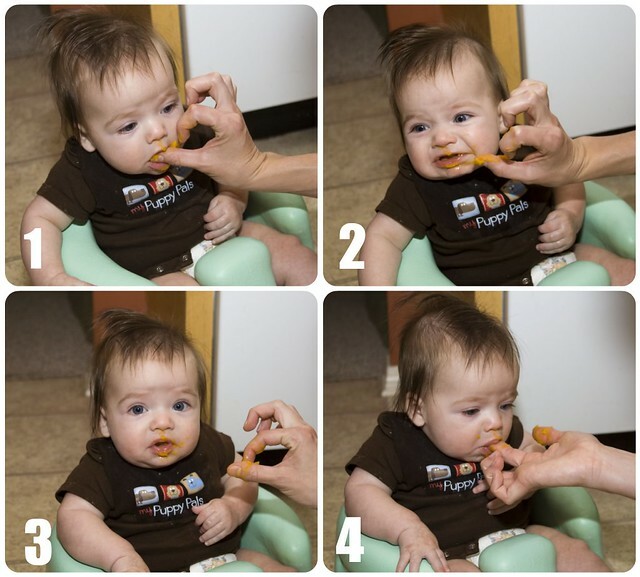 Each cube is equivalent to 1oz, so if your baby is on stage 1 foods, that's about 2 cubes, and stage 3 foods is about 3-4. 2. What IS this stuff?!?! 3. I don't know about this stuff daddy! 4. I guess I like it. I'll take more please! Sometimes I have to slide a pearing knife on the side of the cubes to get them to come out. I put my finished cubes in a ziplock 1 gallon freezer bag (the kind with the slider top work best), and label and date the bag, then store in the freezer. I normally make enough to last me 2 weeks or so, and never had any problem with it going bad. 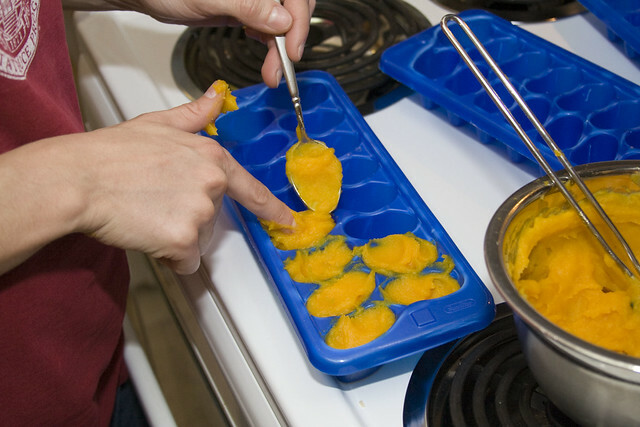 If you want to make the food you can either dethaw right out of the freezer, or leave out to thaw too. Easy peasy right?! The Best Sound in the WORLD. Facebook Status Friday. I'm Back. Wordless Wednesday: My Little Model Boy. Connor, the Crazy Haired Child. 5 Months Old... What the What???? I'm Alive. And Other Random Thoughts. Last Day to Be One. Weekend in Review... It's a LONG one folks!